The past week in monetary policy saw interest rate decisions announced by six central banks around the world. 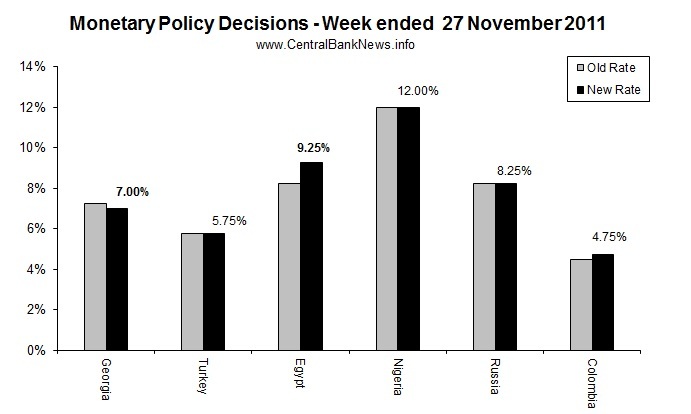 Of those changing rates, Georgia dropped -25bps to 7.00%, Egypt increased +100bps to 9.25%, and Colombia increased +25bps to 4.75%. Meanwhile those that held interest rates unchanged were Turkey at 5.75%, Nigeria at 12.00%, and Russia at 8.25%. Croatia also announced a cut to its Lombard rate (-275bps to 6.25%). Elsewhere, China made headlines when it was revealed that a number of rural cooperative banks were to have their required reserve ratios reversed by 50 basis points to 16.00%. Also, the ECB noted it had purchased EUR 8 billion last week, up from EUR 4.5 billion the previous week. Looking at the central bank calendar, there’s a series of emerging market monetary policy decisions due to be announced; Brazil will be one of the key ones to watch as it previously cut its rate twice in a row at its past two meetings. The other emerging market central banks will also be informative in terms of how the policy makers are thinking about their economies. Elsewhere the US Federal Reserve will release its Beige Book economic survey on Wednesday. Source: Central Bank News, November 26, 2011.